CDM. This stands for Celebrity Deathmatch, that claymation show from MTV where different celebrities are pitted against each other in a boxing ring, usually to the death. Even though I didn’t really watch the show, I like to use the concept when talking about things I want to pit against each other. Like my various medical issues. This probably should have been #1, but today is the Stop HHS Rally! It’s taking place, to my knowledge, throughout the country at 12 pm today. I will be attending in Ann Arbor, and will hopefully have some pictures to post later in the day. First amendment rights, Freedom OF Religion (**Not freedom FROM religion**), and the ability to follow your conscience are definitely things that I think are important to stand up for. 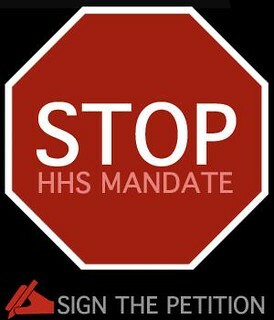 If you would like more information or would like to sign the petition, please visit the Stop HHS website. Rollerblading at work! One of my coworkers brought in rollerblades today. This is awesome! 🙂 I love my team! 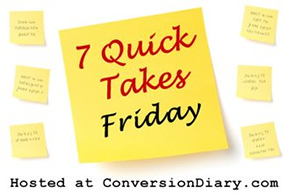 Is anyone else in shock and disbelief that Holy Week is coming up so soon? This happens *every* Lent. Do not get me wrong, I love Easter, but I think I need a little bit more Lent before I am really “ready.” That said, I am so excited! for the activities of Holy Week. Chrism Mass in particular. This is one of my favorite liturgies of the entire year! Does anyone else have a problem with returning library books on time? I seem to have some sort of pathological condition which precludes me from being able to make a library book deadline. No matter what, I’ve very rarely been able to check out a book without incurring a fine. Which I rationalize as my way of supporting the library financially. However, with the parish library, this can get out of hand. For example, I have one book that I checked out of the parish library about 3-4 years ago…. They only let you check it out for 3 weeks at a time. I’m only halfway through reading it. They did send me a note once, asking for it back. This was about a year and a half ago. Well, now I have checked out two books from my other parish library. And they are due on Monday. What do you suppose the likelihood is of my returning them on time?